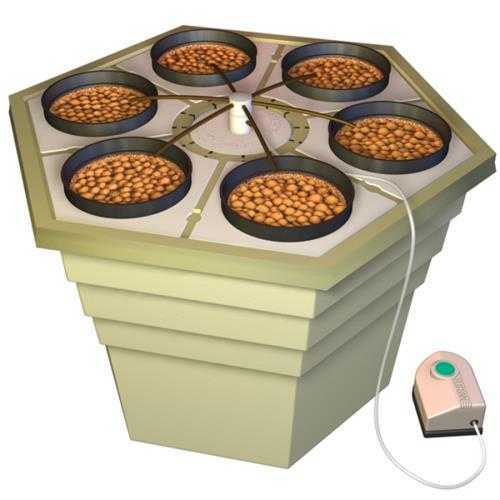 The EcoGrower® incorporates an air driven spider drip system and uses the same revolutionary hexagonal reservoir with removable 6 in lid inserts. Each lid insert will accommodate one 6 in net pot that can easily grow very large plants. In keeping with our commitment to the environment, General Hydroponics® will soon release versions of the EcoGrower® that will operate with electricity recovered from solar panels. Includes: 17 gallon reservoir, spider drip assemble, pumping column, insert lid, 6 - 6 in lid inserts, net cups, CocoTek® liners, Elite 800 air pump, 1/4 in air line, clay pebbles, and Flora nutrients.